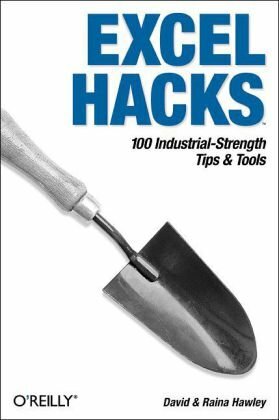 The tips and tools in 'Excel Hacks' include little-known 'backdoor' adjustments for everything from reducing workbook and worksheet frustration to hacking built-in features such as pivot tables, charts, formulas and functions, and even the macro language. Asbjï¿½rn Wahl is director of the Campaign for the Welfare State. He is also an adviser at the Norwegian Union of Municipal and General Employees and holds an elected position at the International Transport Workersrsquo; Federation. He is an active member of the Labour and Globalisation network. Raina Hawley of Perth, Australia is a professional Microsoft Excel consultant whose company, OzGrid Business Applications, offers services in all aspects of Excel, and VBA for Excel. The company's web site at www.ozgrid.com provides online and email Excel training, a directory of useful Excel add-ins, a user forum, and lots of tips and tricks. Raina is also a lecturing team member at West Australian Institute of Management (WAIM) with specific expertise in Word, Excel, Powerpoint, Internet and email.